November 29, 2016 | 11 a.m. Journalism students with reporter Faiz Siddiqui in front of The Washington Post during the students’ recent trip to the Associated Collegiate Press (ACP) National Convention in Washington, D.C.
As fall athletics come to a close and there’s talk of playoffs and defending titles, another campus group is celebrating back-to-back winning seasons. The Clarion student newspaper won First Place Best of Show at the Associated Collegiate Press (ACP) Fall National Convention in Washington, D.C., after winning the same award in Austin, Texas, in 2015. 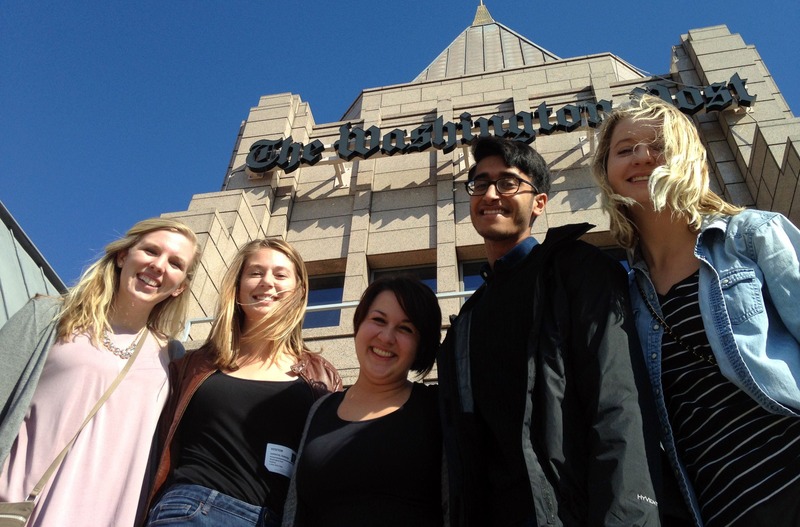 Four Clarion editors attended the Washington, D.C., conference last month. They submitted the paper's third issue of the year—a special issue that focused on the community’s positive response to a racial incident on campus—and won first place in the less-than-weekly newspaper category for four-year institutions. Entries were judged on-site by a panel of educators and professional journalists, and winners were announced during the final session of the conference. Callie Schmidt ’19, a journalism major with minors in gender studies and reconciliation studies, is on the news team at The Clarion. She was part of the team who put together the special issue, and she was also present to accept the award. She says the opportunity to cover a real-time, current issue on campus—with overviews of the events, photography, and related statistics—was not easy, but formational and educational for the team of young journalists. Within five days of students painting over a #BlackLivesMatter message on the boulder in Kresge Courtyard, the editorial staff had set aside their previously planned stories, put together a special issue, and gone to print. Especially within a tight-knit community like Bethel—and with strong emotions surrounding the events that ensued—they had to balance truth-telling with caution. “It was a very difficult topic to cover because I didn't want to exploit the pain of students on campus just to get a good photo or story,” Schmidt says. “It was difficult to balance people of colors' right to privately lament and yet still make sure their voices were being heard and that their perspective was being published.” While it’s not always easy, she notes that experiences like attending the recent conference in Washington, D.C.—and even covering tough topics —challenge students like her and reinforce their belief in the power of good journalism within a community. Bethel’s journalism program—and The Clarion team—has grown in recent years. The newspaper’s staff has increased from about a dozen paid editors and a smattering of freelancers to more than 40 writers who are paid per assignment. With about 40 students currently majoring or minoring in journalism, and about as many news team positions on The Clarion staff, most students can graduate with published work. 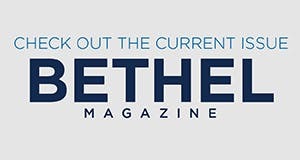 The Bethel University Clarion newspaper is run independently by students and supported in part by the Johnson Center for Journalism and Communication, which is directed by Dave Kansas. Find out more about Bethel’s journalism program.